Roger Montgomery studied at the University of York and at the Guildhall School of Music and Drama with Anthony Halstead. Interested in contemporary music and period instrument performance, he plays horn with many of the leading groups in both fields, and aside from being Principal Horn with the Orchestra of the Age of Enlightenment (OAE), he is also a member of the Orchestra of the Royal Opera House and frequently plays guest principal with many other London orchestras. 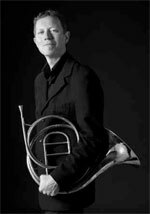 As a soloist, Roger regularly plays in the UK, Europe and Australia and has performed such works as Weber’s Concertino on natural horn live on Finnish Radio and Schumann's Konzertstück in London, Paris and New York. He has also performed these works in the UK and on tour with the OAE, as well as appearing several times as soloist at the English Haydn Festival. As a founding member and conductor of Jane's Minstrels he has given many premieres and performed at leading festivals in the UK and in the USA, Scandinavia and Europe, directing recordings for the NMC label among others and frequently broadcasting for the BBC. Roger teaches at Trinity Laban, the Royal Academy of Music, Royal College of Music and the Guildhall School of Music and Drama. He was Chairman of the British Horn Society between 2009 and 2012. In this recording, Roger uses a Webb/Halstead Bohemian horn copied after Franz Stohr, Prague.